A resting hollow knight. Fights back vigorously if struck, but otherwise completely harmless. Sitting under a tree in the middle of the mossy courtyard, right up the ladder from the Crestfallen's Retreat bonfire. Fights with a sword. Sitting outside in the ramparts, near the Exile Holding Cells bonfire. Fights with a spear. Sitting on the side of the road just past the shrine. Fights with sword, but drops a lance. Various Locations (on the left as you enter from Majula, after the first Old Knight, to the right of the circular room with 3 Old Knights, blocking an iron chest containing the Ring of Binding outside the Dragonrider boss door). There are also 2 hostile Knights to the left of the circular room that will attack when approached: one with a sword, another above the steps with a spear. In the watery area, last upper cell on the left. Fights with a spear. Wearing Heide Knight's Iron Mask. Fights with a lance. The weapon drops are guaranteed, save for the Heide Greatlance, which is an uncommon drop. 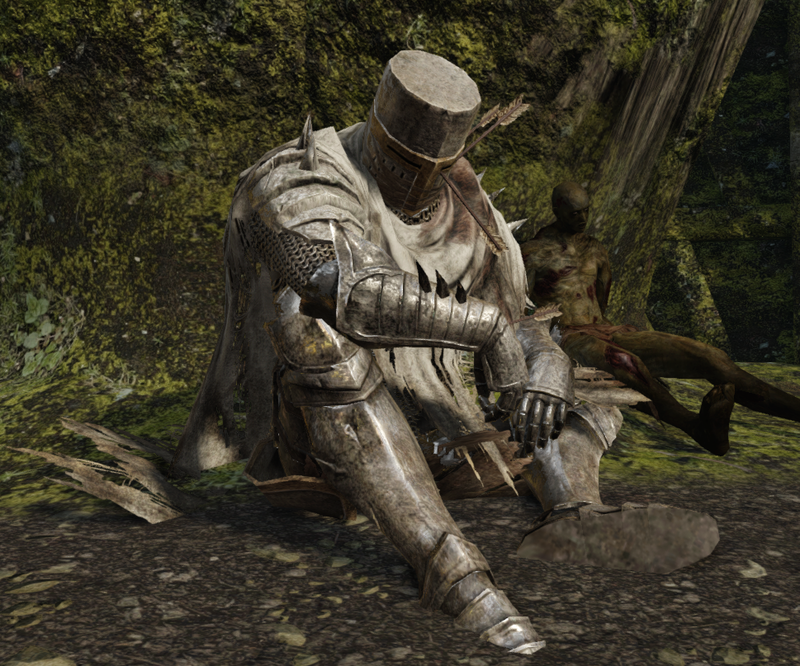 When a Heide Knight is sitting, performing a guard break will cause him to stand up and patrol the surrounding area, all while being unaggressive. This presents opportunity for an easy backstab (the one at the Shrine of Winter is not initially found leaning against a wall, and can be backstabbed from his sitting position). This works only in the vanilla game, not in the Scholar of the First Sin edition. They tend to swing their weapons wildly, sometimes ending a combo with a fast slash directly to their behind. When in such a frenzy, they often begin glitching and moving faster than their walk animations, causing them to slide over the surface of the ground. This unpredictable behavior can make them extremely dangerous to lower level players. They use the player's bonfire sitting animation when encountered. When hit by a 2H strong attack or running attack from ultra greatswords, they will be staggered in a way that allows you to perform a guardbreak critical attack on them. The 2H thrust (from the Zweihander or the Black Knight Ultra Greatsword), and the 2H smash (from the Crypt Blacksword or the King's Ultra Greatsword) work best. The "golf swing" attack has a long recovery time, making it difficult to follow up with a critical attack. Some other attacks that can knock enemies airborne (spinning slash from the Majestic Greatsword, for example) also work.